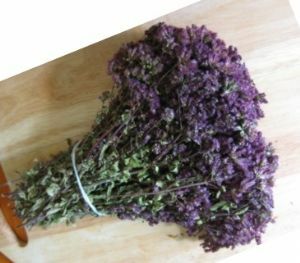 Marjoram is an upright, bushy, purple-tinged, culinary herb. It has a distinctive scent which carries a long way on a hot, still day. The dense, round, rose-purple flower clusters terminate the stem. This plant likes lime-rich soils on grassland, hedgebanks or scrub. Nowadays, it is almost always used as a culinary flavouring rather than a medicine. Origanum is often used in the treatment of colds and influenza. An infusion of the fresh herb is said to benefit an upset stomach and indigestion, headache, colic and nervous complaints as well as for coughs, whooping cough and other respiratory ailments. It is also thought to relieve menstrual cramps and makes a calming and tonic bath additive. An infusion of the flowers is said to prevent seasickness and to have a calming effect. Origanum can be used as a mouthwash for ulcers and inflammation of the throat, or it may be used externally for infected cuts and wounds. Tension headaches may be relieved by an infusion or by rubbing the temples with oil of marjoram. The oil may also be rubbed into areas of muscular and rheumatic pain, and topically for toothache. A lotion can relieve stings and bites. The bruised leaves placed in a pillowcase may be helpful for insomnia. In the kitchen it is used to season stews, either dry or fresh. It is very aromatic and refreshing in salads and provides very good flavor to the meat, fish, rice, birds etc. From the antiquity its use as food goes back at Egyptian times when, among other properties, it was considered aphrodisiac . Much used in the Indian cookery, which has made India a great producer of this spice.